Background: Intraoperative cytology (IOC) is a simple and quick technique with excellent preservation of cellular details. In the present study, we have evaluated the role of IOC by various methods of smear preparation and compared it with frozen section diagnosis. A scoring system was followed for epithelial tumors for characterization and grading on the basis of cellularity, pattern, nuclear, cytoplasmic features, and background details. Materials and Methods: The study was conducted during a time span of 2 years in total 48 cases of ovarian tumors. Fine-needle aspiration cytology, touch/imprint, scrape, and crush techniques were used. The smears so prepared were processed for toluidine blue and Giemsa and Papanicolaou staining. 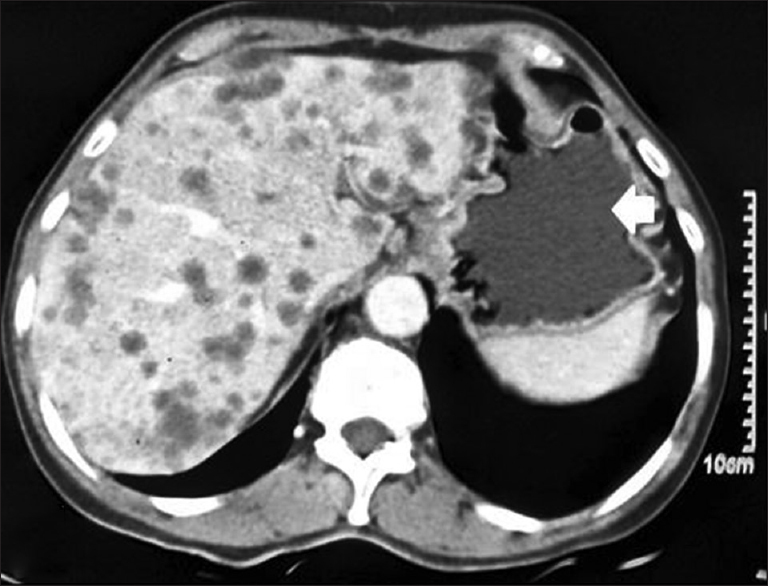 Cases were cytomorphologically categorized into four groups: Indeterminate; unequivocally benign; borderline tumor with equivocal morphology; and unequivocally malignant (graded into well, moderately, and poorly differentiated). Results: In our study, the sensitivity, specificity, positive predictive value (PPV), negative predictive value (NPV), and accuracy of 88.88, 96, 96, 88.88, and 92.31%, respectively, were recorded. This was comparable to frozen section diagnosis with a sensitivity, specificity, PPV, NPV, and accuracy of 85.18, 96.15, 95.83, 86.21, and 90.56%, respectively. In epithelial tumors, cytological grading correlated with histopathological grading in 85.29% cases of epithelial tumors. Conclusion: IOC gives comparable results to frozen section and can be used for intraoperative assessment of ovarian tumors. Grading of epithelial tumors on IOC can be performed and may become an important step in intraoperative decision-making for better management and outcome of the patient. Objectives: One percent toluidine blue being the most effective adjunct is often used to detect dysplasia. 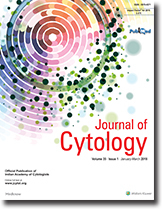 Not much attention has been given to the effect of toluidine blue in enhancement of cytological smears. The present study assessed the smears before and after application of toluidine blue in smokers against non-smokers using three different stains [Papanicolaou (PAP), Hematoxylin and Eosin (H and E), and Giemsa]. Study Design: Twenty-five individuals from each group participated in the study. The oral cytosmears were obtained before and after application of toluidine blue and assessed for clumping of squamous cells, cellular and nuclear pleomorphism, micronuclei, binucleation, bacterial colony units, and keratin flakes. 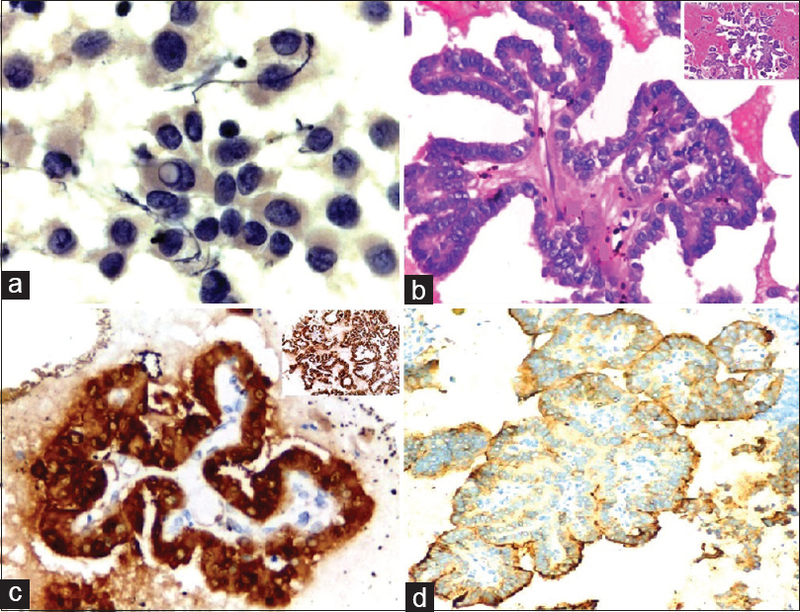 Results: In smokers, the maximum enhancement in cytological smears post-toluidine blue application was shown by Giemsa stain than PAP and H and E stains. Among the individual parameters, nuclear pleomorphism exhibited greatest significant difference between smokers and non-smokers. Conclusion: Toluidine blue enhanced the staining characteristics both in terms of sensitivity and specificity and thereby was found to be synergistic in assessment of cytosmears. The cellular alterations noticed in the smears of smokers with clinically normal buccal mucosa can be used as a means of education tool in counselling for smoking cessation. Background: Fine-needle aspiration cytology (FNAC) is still an important first line diagnostic procedure in developing countries. FNAC of breast lesions is quite specific and sensitive investigation and the results are comparable to histopathology. Aim: To evaluate applicability of parameters of different cytological grading (CG) systems, for aspirates of breast cancers, and its correlation with histopathology grading parameters. Materials and Methods: A cross-sectional observational study was carried out on 30 female patients with ductal carcinoma breast, diagnosed on FNAC and subsequently confirmed histopathologically. 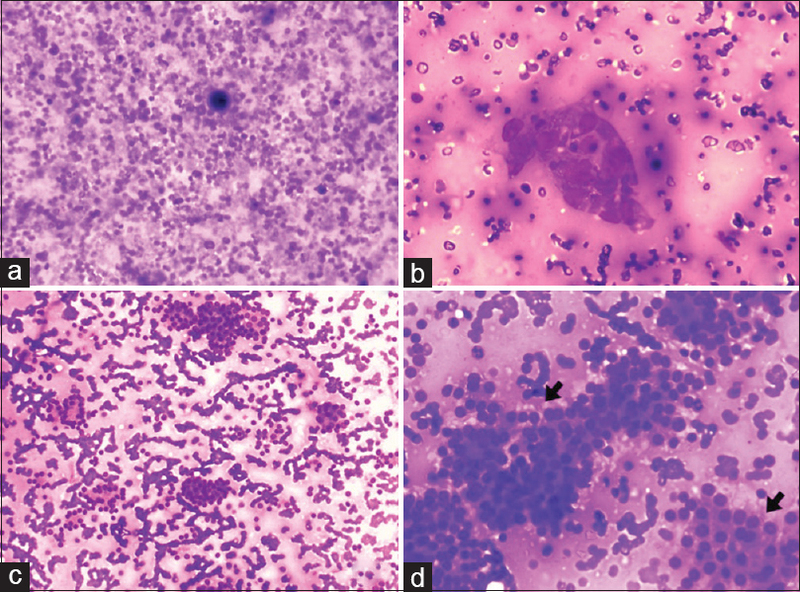 The cytological smears were graded using six different cytological parameters/criteria described by Robinson et al. (Robinson grading system) and modified Scarff-Bloom-Richardson (SBR) grading system considering three parameters. The results of cytological grade (CG) were compared with parameters of gold standard modified SBR histological grading (HG) system. Results: Important influential cytological parameters to predict final RBS cytological score came out to be chromatin, nucleoli, nuclear size, cell uniformity, and cell dissociation with statistically significant P value (0.0001) except for mitotic count. The important influential predictor of final SBR histological score is nuclear pleomorphism. Conclusion: SBR HG has good correlation with both RBS and SBR CG systems. The cytological nuclear grade provides important prognostic information which is very sensitive and equally specific hence should be done in breast aspirates and is now replaced by Core Needle biopsy. In developing country like India FNAC of breast aspirates still holds diagnostic value in the classification of breast lesions as compared to core guided image biopsy. Background: Micronucleus is a small fragment of nucleus present in the cells which have undergone chromosomal damage. It is used as a biomarker of genomic damage. Aims: We aim to study the presence of micronucleus on breast cytology smears and the use of scoring the micronucleus as an additional criteria for the classification of breast lesions with emphasis on borderline gray zone categories. Settings and Design: This is a cross-sectional retrospective descriptive study. Materials and Methods: Retrospective analysis of breast cytology smears received over a period of 2 years formed the basis of the study. Micronucleus scoring was done by counting the number of micronuclei in 1000 epithelial cells under oil immersion and compared in the benign, adenosis, usual/atypical ductal hyperplasia, and the three grades of infiltrating ductal carcinomas. Statistical Analysis: Descriptive analyses and one-way analysis of variance was used for statistical analysis. Results: Of the 243 cases, the average statistically significant (P < 0.05) micronuclei scores of the benign (190), adenosis (7), usual (11)/atypical (5) hyperplasia, grade 1, 2, and 3 carcinomas (30) were 0.5, 2, 2.9, 6.6, 13.2, 20.6, and 27.5, respectively (the corresponding median scores were 0.5, 2, 3, 6, and 20, respectively). Micronucleus score of ≤1 had a high sensitivity (100%) and specificity (99%) in confirmation of benign cases. Micronucleus score of ≥5 and <10 had a moderate sensitivity (60%) but a high specificity of 99% in detecting atypical ductal hyperplasia. Micronucleus score of ≥10 had a high sensitivity (96%) and specificity (99%) of detecting carcinomas. Conclusion: Micronucleus scores showed a gradual increase across the categories proving the gradual occurrence of genomic damage. Micronucleus scoring serves as an additional criterion for the diagnosis of breast lesions. Aim: To test the expression of galectin-3 (gal-3) and Hector Battifora mesothelial antigen-1 (HBME-1) on agarose cell blocks (CBs) of fine-needle aspirates aiming to determine their diagnostic value in thyroid follicle cell-derived tumors. Materials and Methods: Forty patients with thyroid nodule were enrolled. Fine-needle aspiration biopsy was done and processed to produce smears and CBs. Immune staining was done on CBs using antibodies to gal-3 and HBME-1. Diagnostic value of tests was determined in comparison to pathology. Results: Current study included 17 papillary thyroid carcinoma (PTC), 15 follicular adenoma, and 8 follicular thyroid carcinoma (FTC). In PTC diagnosis, co-expression of gal-3/HBME-1 had a sensitivity of 94.1%, specificity of 73.3%, positive predictive value (PPV) of 80%, negative predictive value (NPV) 91.7%, and accuracy of 84.4%. In FTC diagnosis, combined gal-3/HBME-1 expression had a sensitivity of 75%, specificity of 78.6%, PPV of 50%, NPV of 91.7%, and accuracy of 77.8%. Co-expression of gal-3/HBME-1 raised the sensitivity of detection of differentiated thyroid carcinomas from 40% with cytomorphology to 92% and accuracy from 62.5% to 85%. Conclusion: The combined immunocytochemical expression of gal-3 and HBME-1 utilizing fine-needle aspirates can improve the sensitivity of detection and diagnostic accuracy of differentiated follicular cell-derived thyroid carcinomas. Objectives: Fine-needle aspiration cytology (FNAC) has emerged as an indispensable tool to discriminate thyroid lesions into benign or malignant for appropriate management. The need for simplicity of communication and standardization of terminology for thyroid FNAC reporting led to introduction of “The Bethesda system for reporting Thyroid Cytopathology” (TBSRTC) in a conference held at the National Cancer Institute in 2007. This study aims at establishing the reproducibility of TBSRTC for diagnosing thyroid lesions. Materials and Methods: The present study comprised thyroid FNAC from 107 patients retrospectively over a period of 1.5 year (June 2013 to December 2014), which were reviewed by two trained cytopathologists and re-categorized according to TBSRTC. The interobserver variation and reproducibility of the reporting system was statistically assessed using Cohen's kappa. Results: The cytopathologists were in agreement in 98 out of 107 cases (91.5%). Maximum concordance was noted in benign category (91 of 96 cases; 92.85%), followed by 2 cases each in nondiagnostic/unsatisfactory (ND/US) and follicular neoplasm/suspicious for follicular neoplasm (FN/SFN) category (2.04% each) and 1 case each in atypia of undetermined significance/follicular lesion of undetermined significance (AUS/FLUS), suspicious for malignancy (SUS), and malignant category (1.02% each). The highest diagnostic disagreement was noted among ND/US and benign and benign and FN/SFN categories. Conclusion: The utilization of TBSRTC for reporting thyroid cytology should be promoted in our country because it provides a homogeneous, standardized, and unanimous terminology for cytological diagnosis of thyroid lesions. The present study could substantiate the diagnostic reproducibility of this system. Background: Anaplastic large-cell lymphoma (ALCL) is a rare subtype of non-Hodgkin's lymphoma (NHL) characterized by the presence of unusual giant cells. It is a CD30+lymphoma of T-cells lineage, which shows anaplastic lymphoma kinase-nucleophosmin (ALK-NPM) rearrangement. ALCL on fine needle aspiration cytology (FNAC) shows unusually large and bizarre tumor cells. 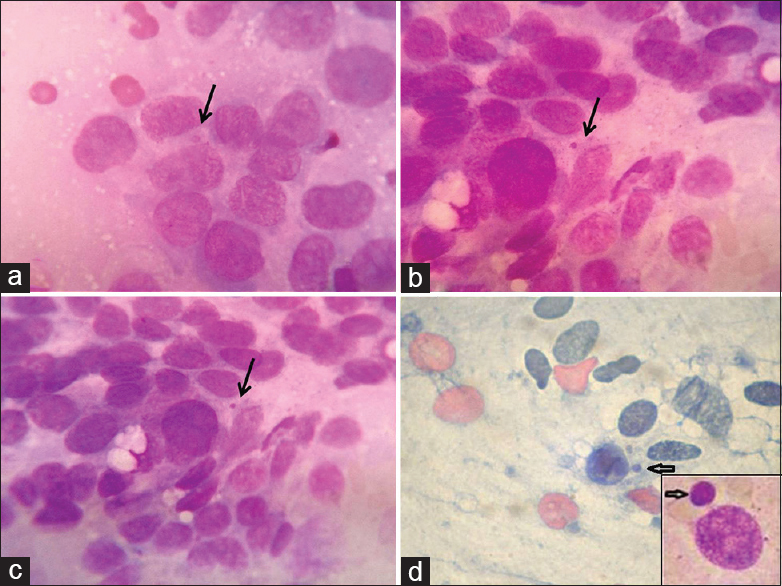 Materials and Methods: All aspirates seen over a 6-year period from November 2009 to November 2015 in which a diagnosis of ALCL or Hodgkin's lymphoma (HL) with bizarre giant cells were suspected on cytomorphology were prospectively selected. Twenty such aspirates were subjected to CD-30 and ALK-1 immunocytochemistry (ICC). Subsequent biopsy was available in all cases. Results: Out of 20 cases, seven cases, suspected to be ALCL on FNAC, were confirmed on biopsy. ALK-1 was positive in both cytology and biopsy of 6/7 of these. Two cases suspected to be ALCL on cytomorphology were HL (1) and diffuse large B-cell lymphoma (DLBCL) (1) on biopsy, both of which were ALK-1 negative on cytology. Eight cases of HL and three cases of large-cell NHL, which were all ALK negative on cytology, were confirmed on biopsy. Conclusion: ICC for ALK and CD30 is useful in aspiration cytodiagnosis of ALCL. One CD30 positive DLBCL and one ALK negative ALCL showed concordant results of ICC on cytology and histology. Background: Fine needle aspiration cytology (FNAC) is a simple, rapid, inexpensive, and reliable method of diagnosis of breast mass. Cytoprognostic grading in breast cancers is important to identify high-grade tumors. Computer-assisted image morphometric analysis has been developed to quantitate as well as standardize various grading systems. Aims: To apply nuclear morphometry on cytological aspirates of breast cancer and evaluate its correlation with cytomorphological grading with derivation of suitable cutoff values between various grades. Settings and Designs: Descriptive cross-sectional hospital-based study. Materials and Methods: This study included 64 breast cancer cases (29 of grade 1, 22 of grade 2, and 13 of grade 3). 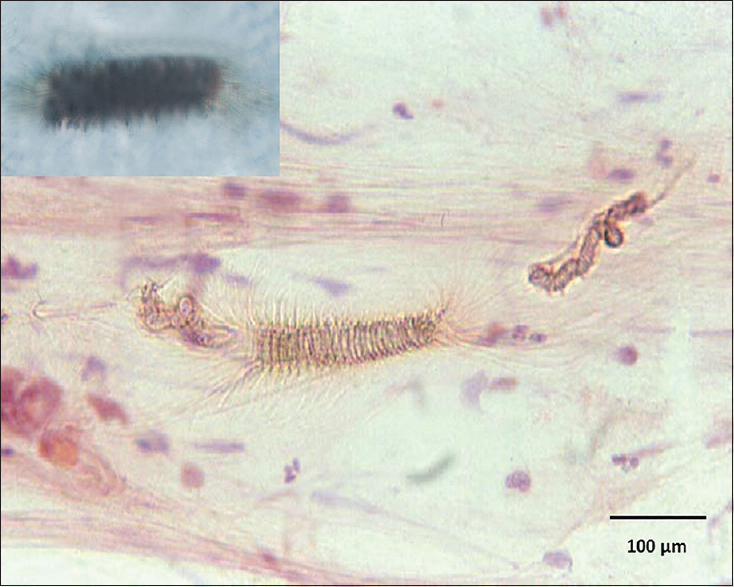 Image analysis was performed on Papanicolaou stained FNAC slides by NIS –Elements Advanced Research software (Ver 4.00). Nuclear morphometric parameters analyzed included 5 nuclear size, 2 shape, 4 texture, and 2 density parameters. Results: Nuclear size parameters showed an increase in values with increasing cytological grades of carcinoma. Nuclear shape parameters were not found to be significantly different between the three grades. Among nuclear texture parameters, sum intensity, and sum brightness were found to be different between the three grades. Conclusion: Nuclear morphometry can be applied to augment the cytology grading of breast cancer and thus help in classifying patients into low and high-risk groups. Background: Conventional Papanicolaou (Pap) stain has undergone many modifications; of these, ultrafast Pap stain is the most popular as it shortens the turnaround time of reporting. 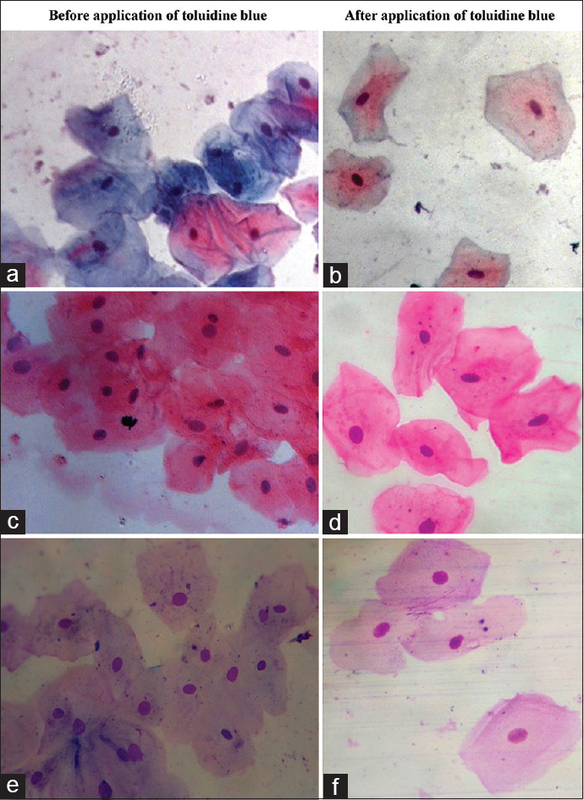 Application of modified ultrafast Pap (MUFP) stain in the evaluation of fine needle aspiration (FNA) samples and body fluids are scanty. Aim: To evaluate the utility of MUFP stain in various FNA samples and body fluids and compare the findings with those of conventional Pap stain. Materials and Methods: In this cross-sectional study, two wet-fixed and two airdried smears from each sample [301 samples (255 FNA samples and 46 body fluids)] were prepared and stained by the conventional Pap and MUFP stains, respectively. Concordant and discordant rate was calculated. 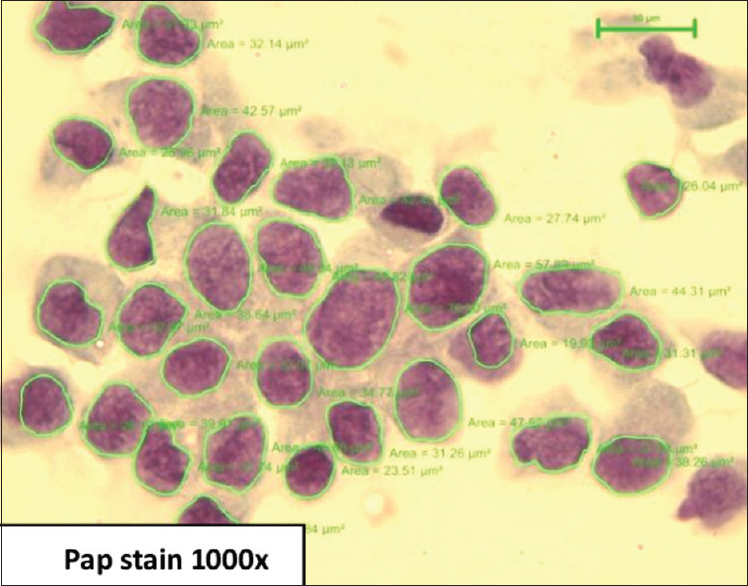 Quality index (QI) of MUFP stain was assessed by background, overall staining, cell morphology, and nuclear characteristics. MUFP-stained smears were also categorized into excellent, good, and fair. Results: The concordance rate for MUFP stain was 100%. QI of MUFP stain for breast, thyroid, lymph node, soft tissue, salivary gland, and body fluids was 0.9, 0.93, 0.95, 1, 0.94, and 1, respectively. Excellent quality of stain was noted in 53.2% and good in 24.6% of the cases allowing easy diagnosis. In 22.2% of fair cases, diagnosis was possible with some difficulties. 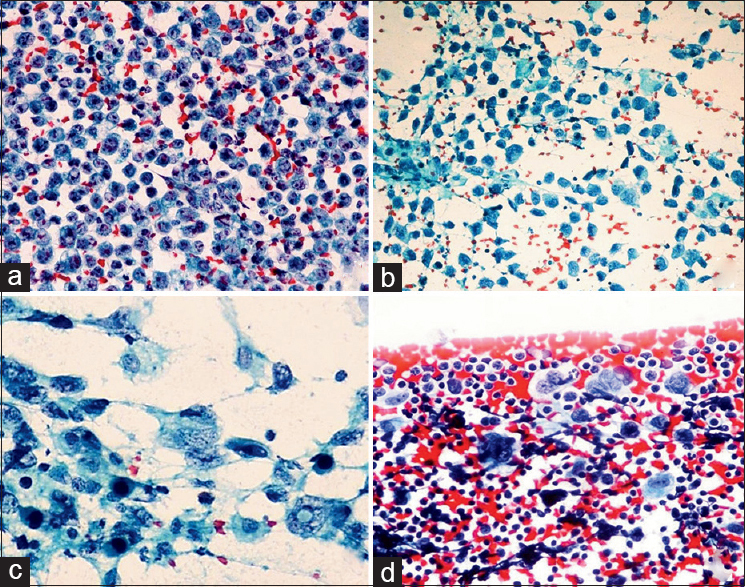 Conclusion: Our study concluded that MUFP stain could be considered as a rapid and reliable diagnostic tool and can be applied on a regular basis in FNA samples and body fluids to offer immediate diagnosis. However, caution should be taken while reporting certain MUFP-stained smears to avoid over/under diagnosis. Basal cell adenoma is a rare type of monomorphic salivary adenoma most commonly involving the parotid gland. Cytology of basal cell adenoma closely mimics many other benign and malignant basaloid neoplasms. Cytological features of membranous basal cell adenoma simulate adenoid cystic carcinoma in fine needle aspiration cytology (FNAC) smears. Here, we are presenting a rare case of cytodiagnosis of membranous basal cell adenoma of parotid gland in an elderly lady, which mimicked adenoid cystic carcinoma on FNAC. 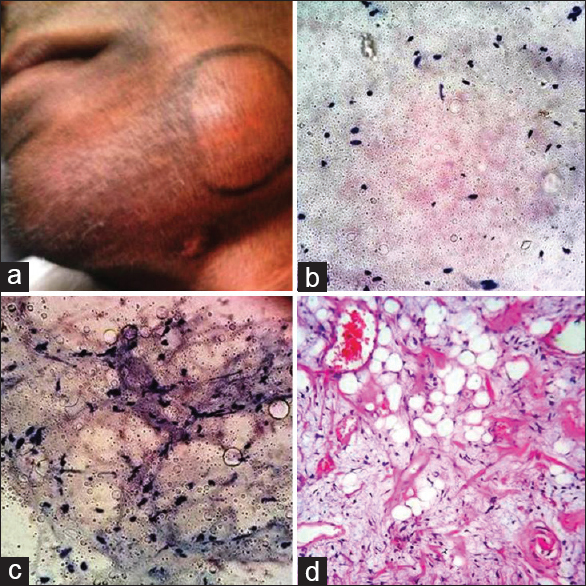 We discuss the cytomorphology of this rare case with an emphasis on cytological difference between membranous basal cell carcinoma and adenoid cystic carcinoma as well as other basaloid neoplasms. Fine needle aspiration cytology (FNAC) is often the first investigation in the work up of salivary gland lesions. However, its diagnostic accuracy is limited by the high rates of false positives and false negatives. Usually, acinic cell carcinoma is prone to be underdiagnosed because of the cytological similarity of the tumor cells to normal acinar cells, however rarely, a predominant papillary architecture on cytology may cause confusion with adenocarcinomas. 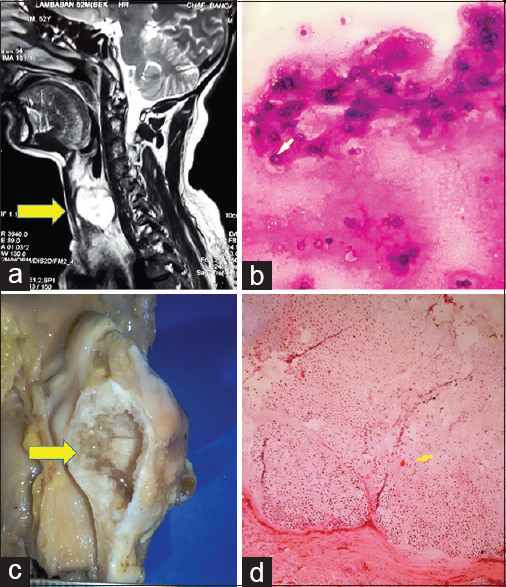 We present a case of a 45-year-old male with a painful swelling of the right parotid region. 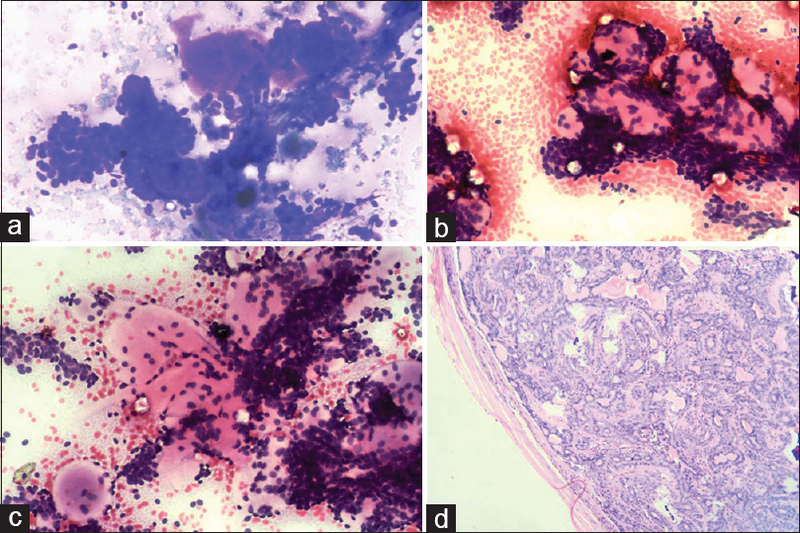 FNA smears revealed a predominant papillary architecture and focal acinar pattern. A provisional diagnosis of acinic cell carcinoma was given, which was confirmed on histopathology. Familiarity with the cytomorphologic features of acinic cell carcinoma is cardinal for an accurate diagnosis and appropriate management. The primary and metastatic tumors of the skin can be effectively diagnosed by fine needle aspiration cytology (FNAC); however, the cytomorphological features of skin adnexal tumors are rarely described in the literature. We hereby describe the cytological features of two histologically confirmed cases of benign skin adnexal tumors. 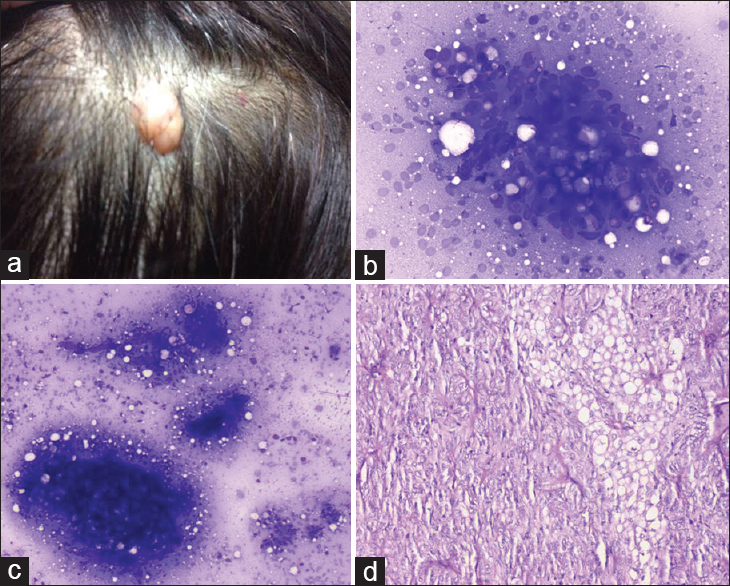 Case 1 is of a 46-year-old female who presented with an elevated firm nodule over the scalp. A cytological diagnosis of benign adnexal tumor possibly of sebaceous origin was given. The nodule was excised and histopathological examination confirmed the diagnosis of sebaceoma. Case 2 is of a 19-year-old male who presented with a pigmented scalp swelling. Cytomorphological features were suggestive of benign skin adnexal tumor with foci of melanin pigment. The swelling was excised and histopathological examination confirmed the diagnosis of eccrine poroma. To the best of our knowledge, only one previous report of sebaceoma and no report of eccrine poroma describing the cytological findings of these two tumors exist. 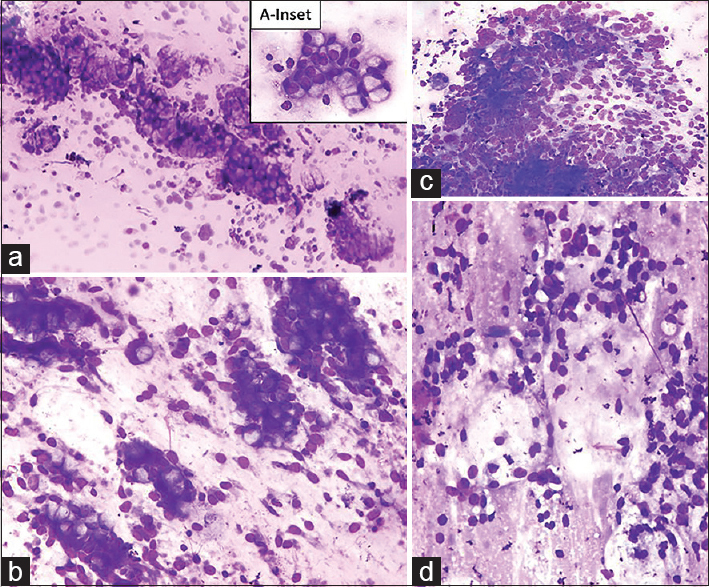 We report these two cases of benign skin adnexal tumors to discuss the cytological features and the potential diagnostic dilemma that they pose to the cytologist. Leprosy is a chronic infectious disease caused by Mycobacterium leprae. 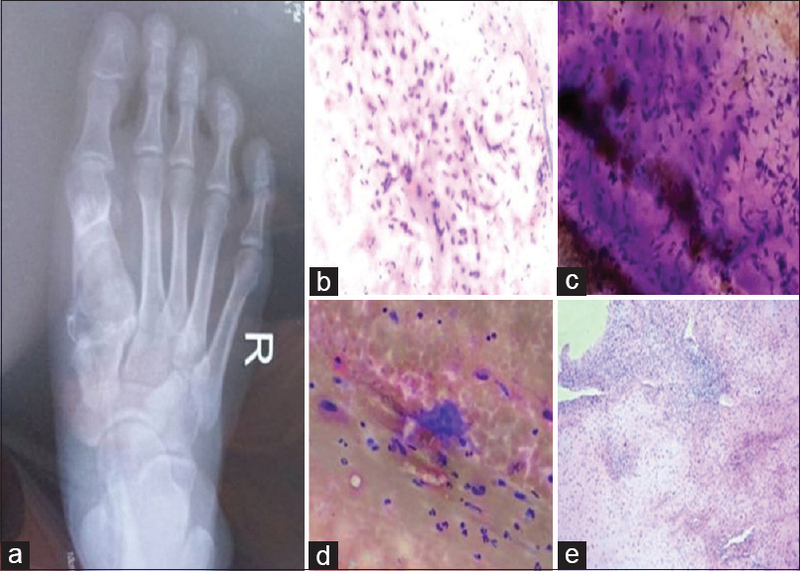 The manifestations of this disease varies across the spectrum of tuberculoid (TT) to lepromatous (LL) leprosy.The course of this indolent disease is interrupted by acute exacerbations in the form of leprare actions. Erythema nodosum leprosum (ENL), a type 2 lepra reaction, occurs in lepromatous or borderline lepromatous cases, usually in response to multidrug therapy. Early detection and timely management of these patients is important to reduce the associated morbidity. 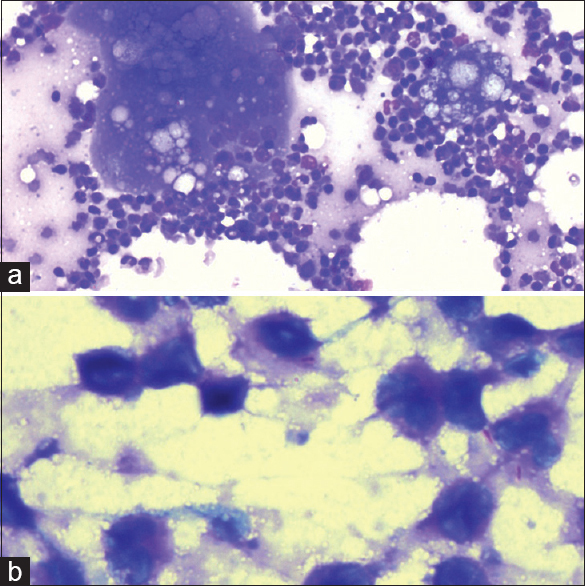 We report two clinically unusual cases of ENL on fine-needle aspiration cytology. In one case, antileprosy treatment was completed 10 years back, whereas in the other case, ENL was the presenting feature of the disease. Cytological examination of swelling in both the cases showed neutrophils, lymphoid cells, clusters of foamy macrophages, histiocytes, and giant cells. Fite stain was positive, which confirmed the cytological diagnosis of ENL.